Johannesburg – The clarion call has been sounded and the time is now! More than 100 youth leaders from at least 30 countries will converge in South Africa for what promises to be one of the biggest meetings of young minds to ever come together on the African continent. The 2nd Breaking Down Borders Africa Youth Summit was recently launched to a captive audience at Brand South Africa in Johannesburg, Gauteng. It was a morning of rousing speeches and youth mobilisation which gave a glimpse of the calibre of awe-inspiring thought leaders that are to be expected in May when the summit takes place. Toni Gumede, Brand South Africa’s Strategic Relationship Manager, said the company’s collaboration with the summit was “a natural marriage” that speaks to Brand SA’s ‘Play Your Part’ drive. “The Breaking Down Borders Africa Youth Summit really resonates with what our organisation is about, specifically with the mandate that is articulated in the National Development Plan regarding strategic and critical intra-Africa relations. This seeks to do what we aspire people to do – to break down borders by building an active citizenship and inspiring new ways of doing things,” she said. Last year’s inaugural summit saw more than 60 young people from 15 countries take part in the two-day conference. 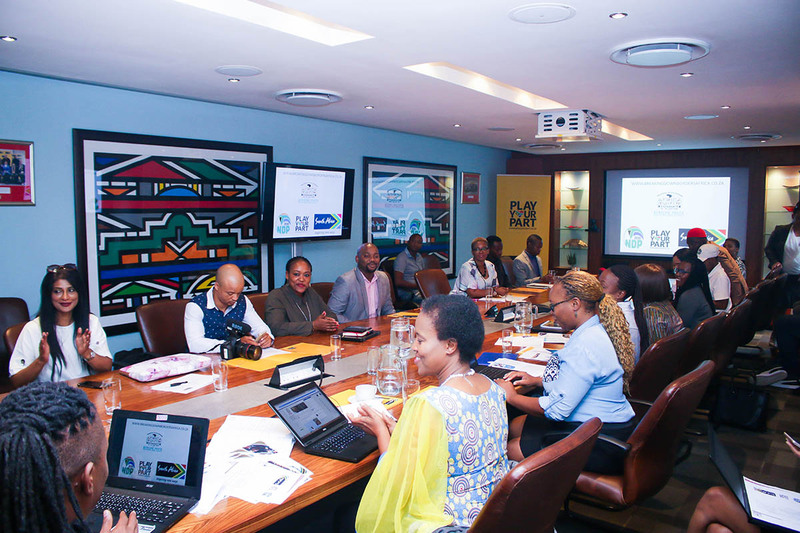 Leaders, entrepreneurs, activists and influencers in the arts, academic and intelligentsia spaces exchanged ideas, challenged each other, and shook up the status quo during passionate debates and plenaries that took part at UNISA in Tshwane and The Maslow Hotel in Sandton. This year the summit aims even higher by turning this into Africa’s biggest platform for networking, skills transfer, workshops and creating professional partnerships for young people. 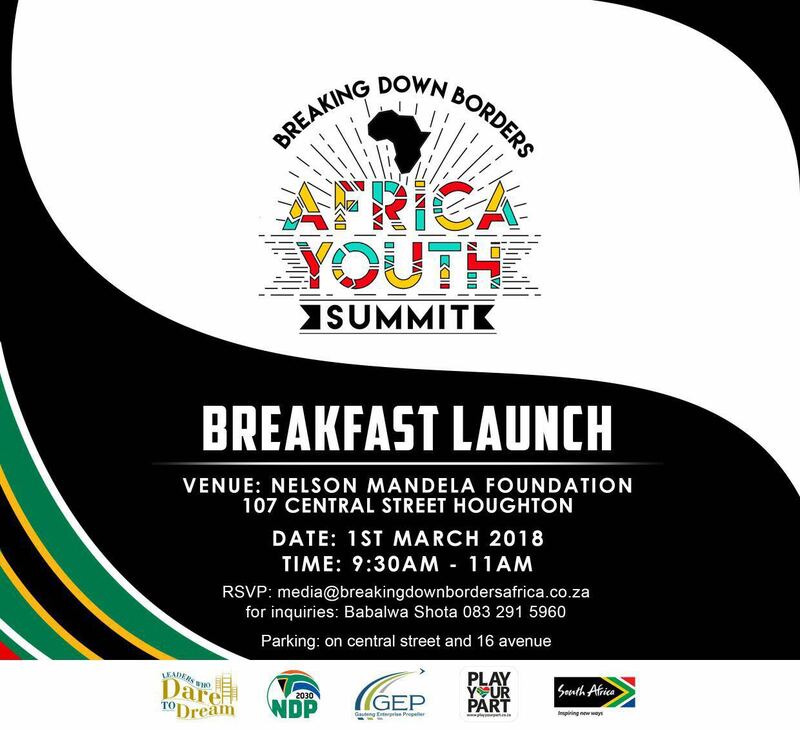 Dr Edith Phaswana from the Thabo Mbeki Leadership Institute unveiled the theme for 2018 Breaking Down Borders Africa Youth Summit: ‘African Youth, Building our Legacy’. In her keynote address she unpacked the theme, speaking to its ode to late statesman Nelson Mandela’s centenary commemoration. She urged the youth to not grow weary as they challenge socio economic barriers that face them, but to take lessons from the legacy of leaders such as Kwame Nkrumah, Nelson Mandela and Patrice Lumumba, who were never deterred. The Breaking Down Borders Africa Youth Summit will be held from the 14 – 18 May, the Official AU ‘Africa Month’ and has introduced an awards segment that recognise and celebrates young people working hard to develop Africa. These leaders are nominated by peers and scrutinised by a panel of elders who are part of the Breaking Down Borders Initiative board of advisors. The nominees will be evaluated for the work they are doing in breaking down boarders and creating platforms for themselves, their community, and the youth. Organising committee member, Lorato Modongo, a young academic and gender activist from Botswana, spoke candidly about Africa’s need for self-sufficiency and youth leadership. Modongo expanded that the 2018 theme, ‘African Youth, Building Our Legacy’, is inspired by the Mandela centenary’s call to action to “Be the Legacy” and thus was urging young people to contribute to building a better Africa through some of the resources at our disposal. She stressed that young people through their energy, thinking, and innovations were one of Africa’s biggest assets. Some of the summit’s expected outcomes are to see increased inter-country trade partnerships, submit recommendations on the Youth Charter to the AU, formulate a network of young African Leaders, and increased collaboration between young people within the entrepreneurship landscape, civil society movements and creative spaces. For the first time since its inception, the summit will be opened to the public via an online application platform. More information is available on the newly minted website, and the BDB’s interactive social media platforms.